Brisbane: Forty years since the trams went silent ? RAIL Back On Track (http://backontrack.org) a web based community support group for rail and public transport and an advocate for public transport has highlighted the fact that on the 13th April 2009 it will be the 40th anniversary of the end of trams in Brisbane. The last Council tram ran on the 13th April 1969 (1). Some of Brisbane's trams are preserved at the Brisbane Tramway Museum at Ferny Grove (2). "Brisbane trams were consigned to oblivion in 1969, on the highly questionable basis of a pro-freeway car transport non-solution. Herein lies the root cause of the present transport problems in Brisbane." 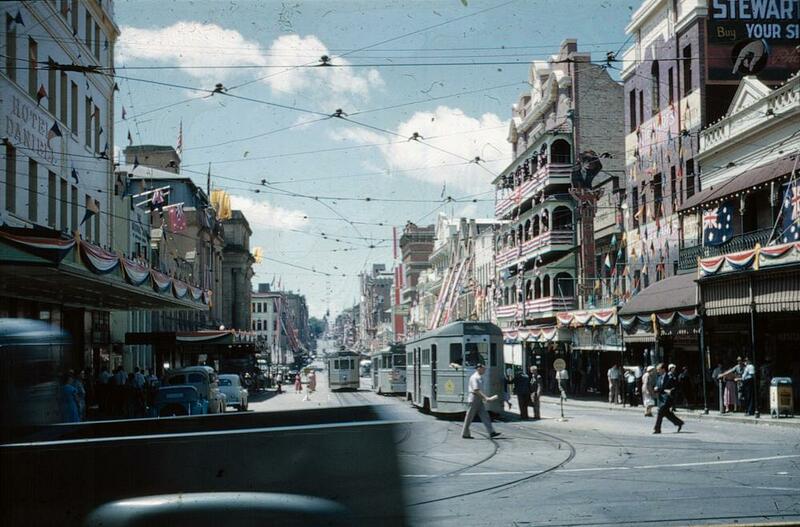 "In Brisbane during 1944-45 trams carried around 160 million passengers. In the final year of operation there were 68 million passengers. Today, an under-resourced rail system, and an overloaded and inadequate bus system struggle to meet the considerable public transport demands. Clearly sustainable light rail and proper resourcing and expansion of the heavy rail network is needed to gain the sustainable mass transit capacity that is needed now and in the future." "The rest of the world is moving ahead with sustainable modern light rail and efficient metro rail transport solutions. Transport in Brisbane is still transfixed on a failing transport paradigm. Bus rapid transport has reached it's limit. Time to move forwards with systems that will gain the capacity that will work." Re: 9 Apr 2009: Brisbane: Forty years since the trams went silent ? Dropcentre tram is filled with passengers going towards the city. 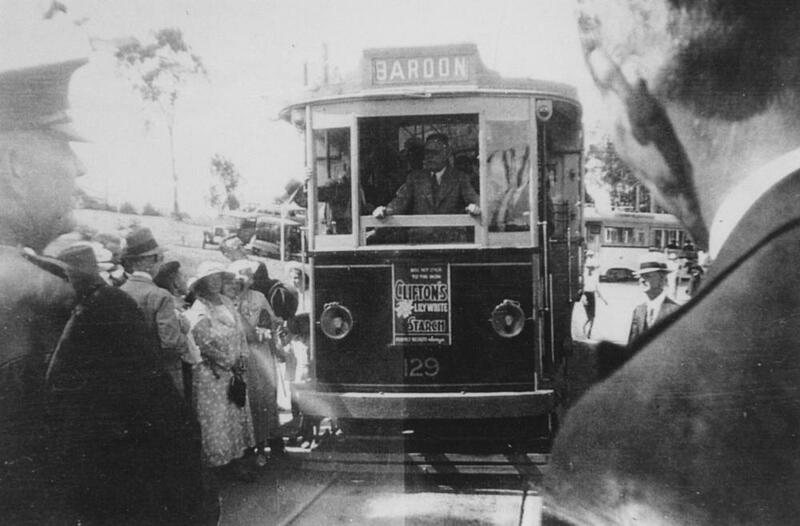 A policeman is directing traffic in front of the tram. Construction equipment can be seen in the background. 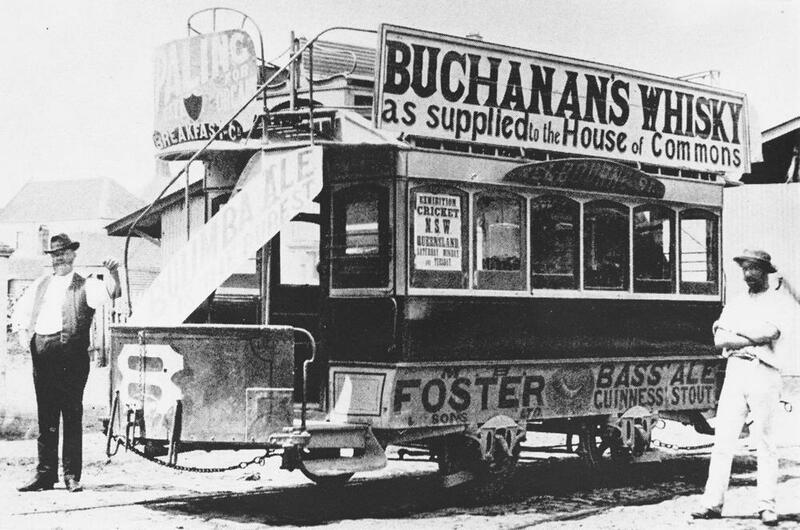 Electric tram with a destination sign of Ascot in its window. Rocklea Munitions factory is visible in the background. This image is free of copyright restrictions. 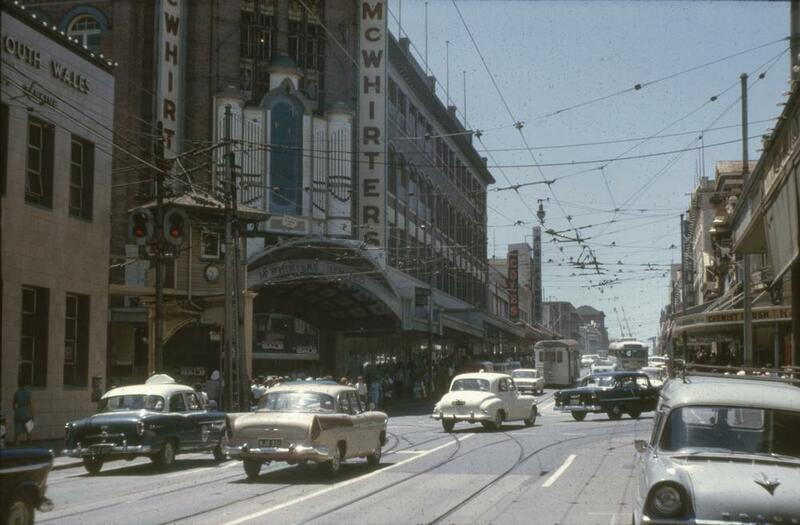 In 1955 McWhirters was purchased by Myer, a Melbourne-based department store chain, which continued to operate the former McWhirters complex as a department store until 1988. The Art deco corner was a landmark in the Valley. Bunting and flags contribute to the exciting occasion of welcoming Queen Elizabeth to Brisbane on her first visit as Queen of Australia. The street is bustling with people and trams are lined up in the middle. Many makes of cars can be seen parked on the side of the street. Overhead tram lines are suspended between the buildings. Image is free of copyright. THE last tram . . . Brisbane's last tram in Queen Street on its way to the Milton tram depot on April 13, 1969. Announcing the details of the new transport links yesterday, Mr Beattie said about three years of planning would be needed but one section of the plan ? the Tank Street Bridge ? already was under way. The light-rail network ? likely to be the biggest in Australia after Melbourne ? will link South Brisbane to New Farm and possibly Bowen Hills. Three pedestrian "spines" running through the city will join four new pedestrian and cycling bridges ? in addition to the Tank Street bridge ? linking West End, Woolloongabba, Kangaroo Point and Bulimba with the CBD. Spencer Howson host 612 Breakfast ABC Brisbane conducted an interview and a brief talkback session highlighting the 40th year anniversary of the end of the trams. Thanks 612 ABC Brisbane! The ARHS Sunshine Express Tours ran a special steam train (BB 18 1/4 1079) from Roma St to Ferny Grove via Tennyson. At Ferny Grove vintage buses took the passengers to the Brisbane Tramway Museum. Here is a photo of 1079 passing through Sherwood on the way to Ferny Grove this morning. Some more photos at ATDB click here! 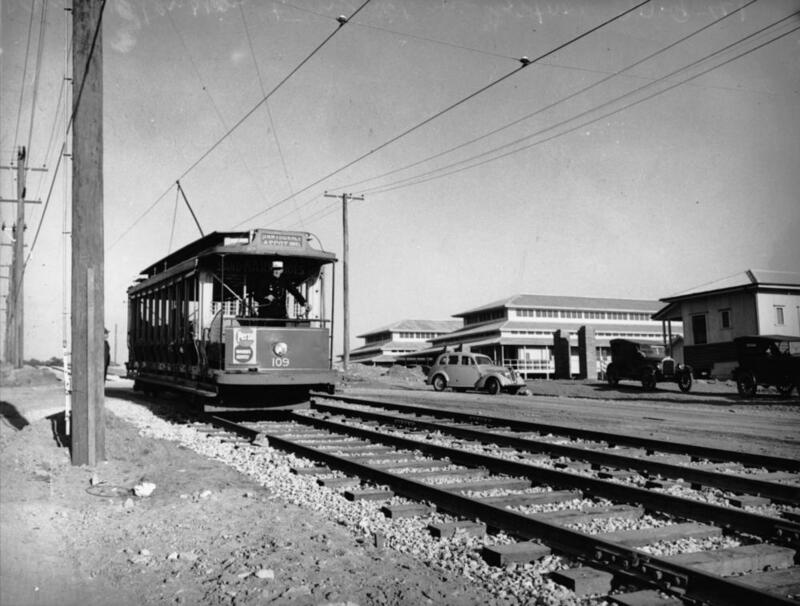 Brisbanetimes --> Is Brisbane set for a tram revival? Renewed interest in trams for Brisbane. There should be. Light rail/trams operate in Sydney, Adelaide and Melbourne. A light rail system is proposed for Perth. Brisbane is the odd one out. I am still chuckling at that RIDICULOUS Cleveland solution. Let's not forget Gold Coast, Canberra and Newcastle in the above quantum!! Track would be in fair condition under the bitumen. Someone in the comments is advocating for a Hi-Speed Suspended Gondola System around Brisbane. 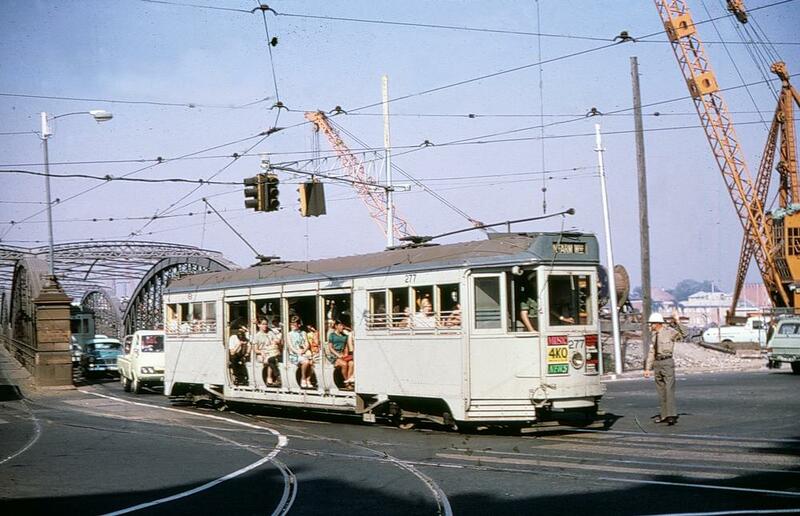 I'd like to see the trams return to Brisbane. I've been picturing it covering all the major corridors, Wynnum Rd, Gympie Road, out to Bardon and Ashgrove, and east to Carindale via Old Cleveland Road. RAIL Back On Track (http://backontrack.org) a web based community support group for rail and public transport and an advocate for public transport has highlighted the fact that on the 13th April 2016 it will be the 47th anniversary of the end of trams in Brisbane. The last Council tram ran on the 13th April 1969 (1). Some of Brisbane's trams are preserved at the Brisbane Tramway Museum at Ferny Grove (2).